Congratulations to our current scholarship winner, Taren Maroun! -Six months of free classes at the Academy beginning Oct. 1st, 2014. -A free AoA uniform shirt. -You must have demonstrable financial need. -You cannot be an existing AoA student. 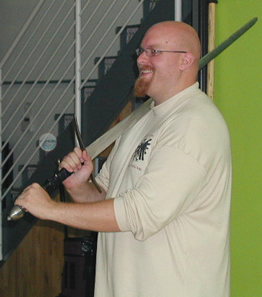 -Email a letter describing your financial situation and your personal interest in studying medieval martial arts. -Finalists will be expected to submit detailed financial information that demonstrates need.